52 Lemon Pies. Mrs. Hodges. Grated rind of 3 lemons with juice of same 1 & 1/2 pints of milk & 1 tablespoon butter melted. The yolks of 7 eggs & whites of 3. Sweeten lemon to taste, then mix. When almost baked, take out of oven & spread over top of pie - the whites of 4 eggs beaten stiff with 4 tablespoons white sugar. Put back in oven & bake till brown. Leave out butter if you wish & use part water instead of milk. Lemon Pies. Annie Eustice. 1 cup sugar, 1 lemon, 1 cup water, 1 tablespoonful corn starch, 1 tablespoonful butter, 1 egg Boil corn starch in the water until smooth. Bake with top crust. Mince Pies. Nellie [Mettman.?] 2 eggs [lightly crossed out], 2 cups brown sugar, 2 cups of molasses, 1 cup vinegar, 1 cup melted butter, 4 cups water, 1 lb. 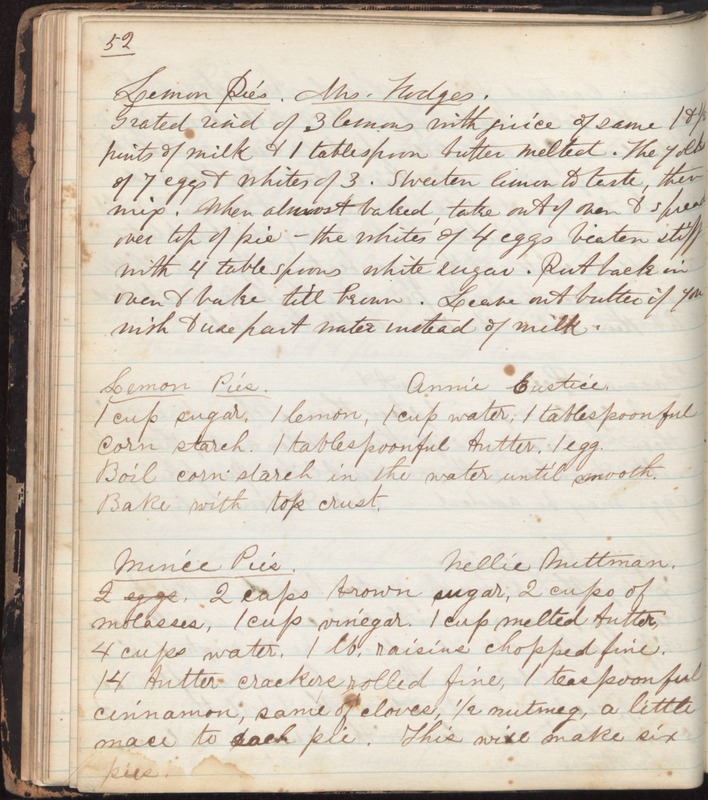 raisins chopped fine, 14 butter crackers rolled fine, 1 teaspoonful cinnamon, same of cloves, 1/2 nutmeg, a little mace to each pie. This will make six pies.